"Rejoice in the Lord always. I will say it again: Rejoice! Let your gentleness be evident to all. The Lord is near. Do not be anxious about anything, but in every situation, by prayer and petition, with thanksgiving, present your requests to God. And the peace of God, which transcends all understanding, will guard your hearts and your minds in Christ Jesus. Finally, brothers and sisters, whatever is true, whatever is noble, whatever is right, whatever is pure, whatever is lovely, whatever is admirable—if anything is excellent or praiseworthy—think about such things. Whatever you have learned or received or heard from me, or seen in me—put it into practice. And the God of peace will be with you." This scripture has been written on a whiteboard in my room for almost four years (it won't come off anymore). God has used this constantly throughout my time as a Christian to give me peace, objectivity and clarity about the things going on in my life. Recently, I've been trying to think of ways the Lord has been good, and give Him thanksgiving and praise, amidst the negative parts of life. We recently went over a part of this scripture in our Collin staff meeting. I'm thankful for a workplace that cares about each other's individual growth and relationship with God and His people! I pray that you can also rejoice in the Lord, giving Him thanksgiving and thinking of whatever is true, noble, right, pure, lovely, admirable, excellent and praiseworthy! Philippians 4:4-9 written on my whiteboard, at the moment hidden behind a drawing and some magnets/pictures (I should probably reorganize my whiteboard). We hosted our Pizza Theology on the book of Exodus, where some of our FOCUS staff broke down content from Exodus in four hours. At the end, we had a Q and A session over the lectures and Exodus. Students were provided with the speaker's notes and some space to write down things that stood out throughout the lectures. 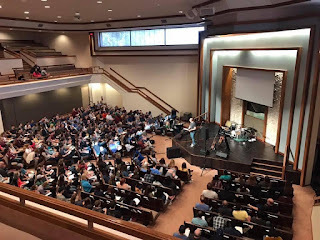 Our staff covered topics from Exodus such as the Tabernacle, Mosaic Law, the relationship between the Israelites and God, and how it all ties into Jesus and the present day. Family Night was a blast! I loved getting to meet our student's friends and families come and see what our ministry is all about. Brandon, one of the student leaders at Preston Ridge, shared about the impact God had on him through a community like FOCUS. As always, the apprenticeship has blessed me with some awesome people I get to spend time with regularly. Here are candid shots of Danny from my core, and Cody, my supervisor. We get to talk about our lives, relationship with God, and everything in between. As always, thank you for taking the time to read this and support me in the various ways that you do. Our FOCUS director at Collin, Garrett, and his wife Erika, are expecting their second child in about 3 weeks! Please pray for health and peace for the excited couple! Students from a ministry we partner with in Washington state are coming down for a week to do outreach/evangelism on our campuses this month. Pray for their travels and opportunity to show Jesus to students at Collin! Thanks for sharing, Alex! That Philippians verse has really ministered to me as well. I love that it's a permanent feature of your white board. Also, Chick-Fil-A really should consider sponsoring us. FOCUS one-on-ones make up a significant portion of their revenue. I'm excited to share the first month of my apprenticeship with you. It's been a great start so far and I am incredibly excited for the rest of the year! Throughout the apprenticeship we get to take different classes covering all sort of theological and practical topics, from financial stewardship to Old Testament foundations. These classes help us discuss different topics and minister to the students on our campuses. The 12 apprentices this year ready to start class and discuss our readings and findings! We started August with our Old Testament foundations class. 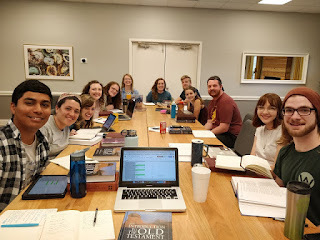 For about 8 hours for two weeks we read scripture starting with Genesis and a textbook breaking down the history and theology of each individual book, as well as listened to lectures covering the different books. Here's my reading set up, complete with a Chick-fil-A cup. 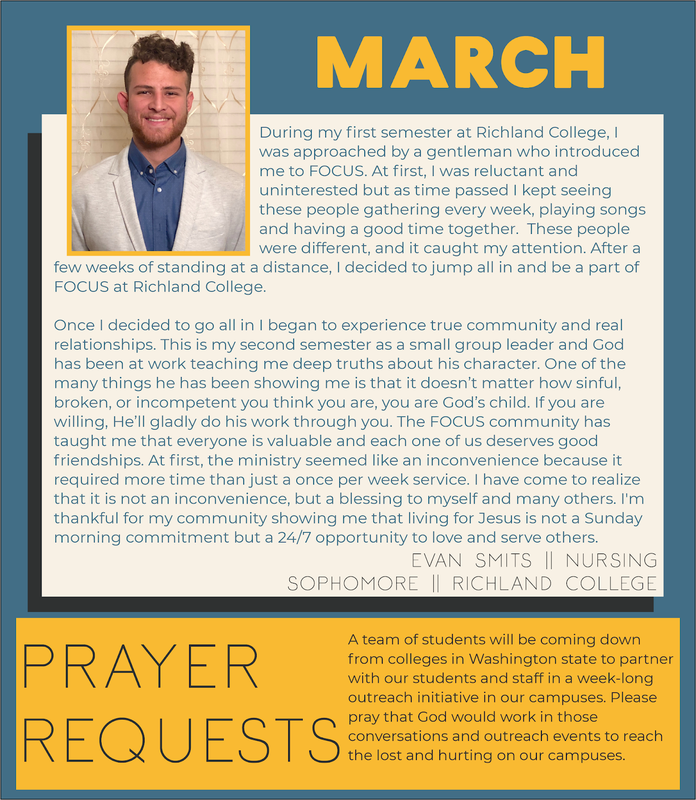 Campus ministry is a heavily relational vocation and lifestyle. For this month's update, I primarily wanted to highlight some people I spend a lot of time with during this apprenticeship. Their friendships and willingness to pour into me in different ways has shaped me so much over the past few months! A picture from our yearly leadership conference, featuring the FOCUS ministries and our parent churches from Garland, Wylie, Denton, and Arlington! This year we discussed using scripture and the stories in it to minister to people. So many people at this conference impacted others who poured into me, and thus indirectly influenced who I am. It was amazing to look around and think about how God has used all of these relationships to impact so many lives both in and outside of that room. The second month of the apprenticeship quickly flew by. September came and went in the blink of an eye, but it was exciting being on the campuses for the first full month with students! We started our weekly outreach/evangelism events at the campuses. We typically do something different each week to engage and get students to think about different topics that are relevant to them. We asked students to respond to questions such as “What is a favorite memory from this semester?” and “What memories influenced your view of God or faith?” They then wrote them on note cards to share and discuss. I started two weekly one-on-one studies with guys in my core (small group). The study is called “Focus on Jesus” or FOJ. FOJ allows us to get to know another person and Jesus, explore scripture, ask each other questions, all while doing life together! Super excited to get to know these guys better and learn something from them as well. An FOJ book, complete with Chick-fil-A cup.